12 ounce can - $2.29 at Hop City in Atlanta, Georgia. Appearance: Pours a clearish, darkened amber-hued body with a smallish, whitish head. Taste: A moderately sweet start, softening the toasted bread qualities. Lightly herbal, spicy-hinting hops with some cleansing bitterness. Softly drying finish. Overall: A skosh sweet, but not bad. L: Attractive dark orange / Copper pour. 1.5 finger head that lasted briefly and left behind nice lacing. S: notes of smokiness and peat over some nice toasted malt notes. Alcohol is present in the aroma. T: Pleasant character, but the alcohol was a bit forward. This beer taste was strong at first but as I drank more I noticed a growing fondness for the flavors. F: pretty basic feel. Nothing very different from most standard marzens. O: good... almost a really winner but... There was something that was nearly too sour for my taste in the flavor. Pulled the overall experience down a bit. I am a huge fan of festbier, and this one is well worth a sip! Good malt backbone, well-balanced hops. 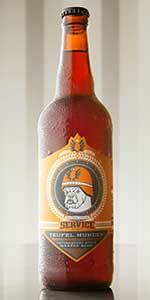 Teufel Hunden is a well-crafted example of an American Oktoberfest beer. look: medium dark copper. A nice foamy off white head that sticks around to coat the top. smell: very subtle toasted malt with a hint of hops. taste: much like the nose with a hint of spice in the finish. Flavor is quite a bit richer than the nose. poured dark amber from 22 oz bomber. light finger of head that dissipates quickly. this is one of my favorite beers from service. it was good last year and im glad its good this year. Very good example of this German Classic. Best domestic Marzen I ever tried. Very good example of this German Classic. Best domestic Marzen I ever tried.